Activities that require strength and speed can strain your teeth, mouth and jaw. That’s why many athletes use custom fit mouth guards. A mouth guard can keep your teeth from clenching, relieve jaw stress and fatigue, and potentially enhance your athletic performance. Custom mouthguards can also protect your teeth. During high intensity sports, teeth can be lost or damaged when the activity gets rough. Custom mouthguards relieve pressure and keep your teeth safe from harm. A mouth guard is an especially critical investment for athletes involved in sports like football, ice hockey, wrestling, boxing and running. Although designed with athletes in mind, you don’t need to play competitively to benefit from the protection that custom mouthguards provide. Some patients also wear mouth guards to protect their teeth while they sleep and to prevent grinding. Whether you are on the field, court, or at home, our Under Armour Performance Mouthwear can help. Under Armour Performance Mouthwear is specially designed to absorb energy, and to keep your jaw from clenching and releasing the hormone cortisol–which can cause stress, fatigue, and distraction. Under Armour Performance Mouthwear is custom-made for each patient individually. 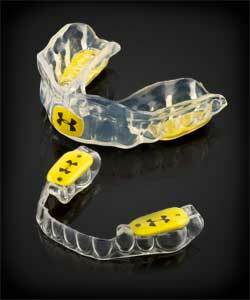 When you come into our office for a mouth guard, Dr. Mason will have an Under Armour Performance Mouthguard made especially for you to fit comfortably over your teeth and to meet your performance needs. To find out more about our custom mouthguards, call us at our office today. We would be happy to answer any questions you might have, and to set up an appointment if you are in the Grapevine area, from Colleyville to Southlake.